Notes from a Bicycle Bodhisattva – may all beings be liberated! May all beings everywhere, with whom we are inseparably interconnected, be fulfilled, awakened, and free. May there be peace in this world and throughout the entire universe, and may we all together complete the spiritual journey. Once upon a time I went for a ride on Cortes Island, with a sore knee and a rusty chain and a battered heart. I had no destination in mind as I chugged up and down, hill after hill, until finally my gears seized and the heavy old bike rolled to a stop. I propped up the bike against a sign in the shape of a wheel, and I started to walk. An odd warm wind was pulling me forward, playing gently through the fine hairs on my forearms. 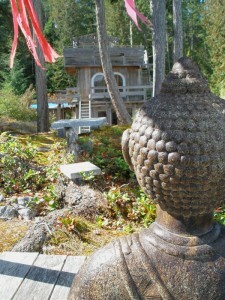 I heard the distant chime of windbells and kept following the dusty path, arriving finally at Dorje Ling Dharma Centre—an ersatz Tibetan fantasy of cedar planks and film set castoffs and rusted metal and sky. Years of cycling in city traffic will make a person brave, and that moment called forth all I the courage I had. I walked under the prayer flags and stayed for six months, at the place where my dharmic path and my bicycle path merged to a single lane. At Dorje Ling I investigated one particular 2,500-year-old roadmap, but there are so many ways to awakening. The bicycle path is another bumpy road to liberation, which every six-year-old recognizes the first time the parent lets go of the seat and she flies free. The experience of self-propelled flight is a taste of freedom from parental control, and later, from governmental and social restriction. Amelia Bloomer had it down. It offers freedom from the repressive craving for vehicular status, that perfect car as promised on tv. Freedom from the global matrix of fossil-fuel addiction. Freedom from suffering through boredom, ill health and lethargy. Freedom from slavery to financial debt. Freedom from the sucking maw of bad credit and bad karma, where we sell off our world’s future for today’s speedy commute. Freedom yah man freedom I say FREEDOM! Freedom lives in the notion of Zen, it’s simple elegance of function and form. Zen lives in the bike’s spare geometry, a simple toolkit and a one drop of oil. My life on the bike path has trained me to appreciate the minimal. With the bicycle as my primary mode of transportation and recreation it is clear how little I really need in order to be content, how much is superfluous, how most of my needs can be so well satisfied with so little. Bike-tour adventuring especially has turned me into a minimalist—cuz who the hell wants to cart all that junk up a hill? I don’t need a house or a storage locker, and I obviouslyy don’t need a garage. My needs are few and my debts are none, and thus I am rich beyond words. Cycling is good meditation. Meditation expands the mind, makes it calmer and stronger. I think of the scene in the movie Deux Secondes where newbie Montreal bike courier (hottie Charlotte Laurier) zones out on her run and spins off into reverie, jolted back at last by the squawk of her radio to find herself far and away into the Quebec farmland. Every cyclist can identify with the experience of getting into the zone, leaving the self behind as boundaries dissolve into the rhythm of the ride. The circular forward motion, the merging of self into air—merging into everything, and into nothing. Becoming One with everything. The whole enchilada. Riding a bike breaks down the physical and conceptual barriers between our selves and the world. When it comes to eradicating the deadly illusion of separation, surely there’s nothing like biking for getting all up close and personal with the Universe. The air, the concrete, the bugs and roadkill and tree—there they are, right in your face. When humans are liberated from metal cages we smell the smells and hear the sounds’s. All of them, from the toxic to the divine. We are all in the soup together. We see the horror and mad beauty of the city that drivers will never slow down enough to apprehend. And we get to see our sleek and beautiful selves, mirrored in the eyes of our cycling sangha—our community of practitioners—as they flash by in smiling conspiracy. The freedom of cycling gets into our blood, and we stop being self-conscious, we lose our consciousness of Self. We start to know in our physical bones that if we treat ourselves well then we treat our planet well. And if we are are doing no harm and defending our planet, then we are healthier people; we have more fun, and we have more energy to give back to the world. Everything we do for the good of others (who are whom?) rebounds right back at us. There is no separation. Bicycles are karma-generating machines, relieving suffering for self and for others. Bicycles provide the strength, spirit, and courage that warriors need. Courage to follow the path. What goes around comes around, and around and around and around. Like a wheel, spinning true. Nice post. Congrats on publication! i too could use a bit (a lot) more minimalism in my life. gorgeous writing my beautiful friend. I’m akshully shopping for a new bike tomorrow – a roadster to get me from Ottawa to Kingston and back by the end of the summer. reading these words could not have come at a better time. there’s a lot to be said for surrendering to sweet serendipity. much love cycling back to you. Woosh, smack, woosh, smack; it’s the sticky sound of a bike tire on summer hot Cortes pavement. A Bicycle Buddha birthed at Babbling Buddha suggests that alliteration is a good omen to watch for on bicycle adventures. Lovely Carmen, may your word and bicycle path be blessed with Beauty.